– Sen. Dianne Feinstein (D-CA), in an interview on MSNBC, about the Trump administration’s policy of separating migrant children from their parents at the border. The venerable Senator Feinstein is correct; we are not Nazi Germany – at least not yet. But we are beginning, in some remarkably troubling ways, to resemble the ill-fated Weimar Republic that preceded Adolf Hitler’s rise to power in 1933. 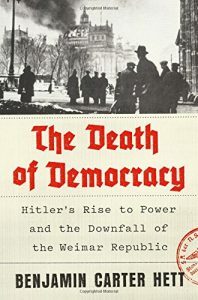 A chilling new book – The Death of Democracy – tells the story of how a cultured, sophisticated people – Weimar Germany was the land of Richard Strauss and Bertolt Brecht, the home to Nobel Prize winners – tumbled into deep political division and then widespread street violence and then a dictatorship and tragedy. We still wonder how it happened and why. Part of the answer, Hett writes, was a breakdown in what was regarded in Germany as acceptable political behavior. Brown shirted toughs took to the streets intimidating political opponents and “others” – Jews and Communists, in particular. German politics became deeply polarized, while nationalism and a national sense of grievance grew. Jews were scapegoated as part of a vast global conspiracy that was somehow tied to Communism. 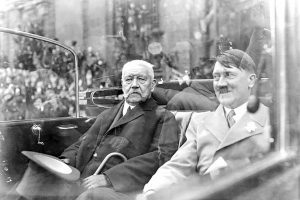 When the German conservative establishment – business leaders, the military, Protestant evangelicals and importantly Great War hero Paul von Hindenburg – eventually turned to a bombastic Austrian veteran who preached a virulent form of nationalism heavily doused with racial animus – Jews were his “vermin” – Adolf Hitler became the German chancellor. His Nationalist Socialist Workers Party had never commanded more than about 30% of the popular vote before he reached the top of German politics. “These conservatives could have stopped Hitler in his tracks,” Hett writes. “Instead, they chose to use him.” Business leaders liked his talk of an expanding German economy, higher tariffs and his plans to crack down on labor unions. Military leaders, smarting from how the Great War had ended, appreciated Hitler’s pledge to rebuild Germany’s armed forces. Evangelical Christians flocked to him because he seemed to promise that he would marginalize other Catholic backed political parties. Within a matter of weeks after being appointed chancellor, Hitler, a brilliant communicator with a flair for the theatrical, had consolidated power to himself. 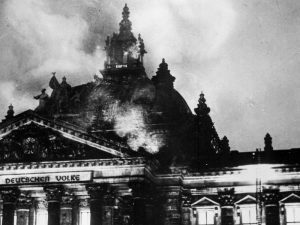 The burning of the Reichstag – the German parliament building – four weeks after he took office was a galvanizing event, an excuse to create a police state. Hitler blamed the fire on Communist conspirators, almost certainly a lie, and historians still debate whether the Nazis staged the whole thing. Without regard to facts, Nazi paramilitary brown shirts began locking up political opponents, silenced the independent press and deepened the Nazi party’s appeal to very conservative German farmers and small business people who craved stability. Hitler assumed dictatorial powers in Germany thanks to a series of lies, boasts, grand promises and raw appeals to emotion, racism, hatred and strength. Many Germans thought the strutting, one-time postcard painter with the pasty complexion simply wouldn’t last. But while he played his role Hitler could be a necessary evil – a tool – to crush the liberal left, the trade unions, intellectuals and elites. History is made of such horrible miscalculations. There are, of course, no perfect historic analogies. Each generation stumbles ahead or falls behind on it’s own accord, but it is also true that history contains valuable lessons that we would be wise to heed. This is such a moment. When politicians say, as the American president did recently, that “We cannot allow all of these people to invade our Country. When somebody comes in, we must immediately, with no Judges or Court Cases, bring them back from where they came. Our system is a mockery to good immigration policy and Law and Order. Most children come without parents.” We would be well advised to take them at face value. The American Constitution, of course, guarantees due process – to everyone regardless of legal status. Dehumanizing your opponents is a tried and true tactic of authoritarians. When the president of the United States calls Hispanic or Latino human beings “animals” or “thugs” or “vermin” and refers to an African-American congresswoman as “an extraordinarily low IQ person” it is impossible to see such language as anything but dehumanizing. By responding to the congresswoman’s incendiary and profoundly improper encouragement of harassment against Trump Administration officials with his own taunts – “be careful what you wish for” – the president doubles down on a politics of confrontation and demonization. 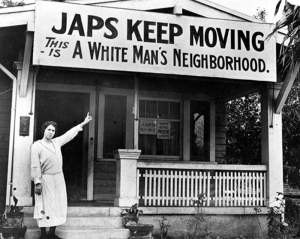 Former first lady Laura Bush explicitly compared the administration’s recent border separation strategy with the infamous “internment” of Japanese-Americans in 1942, one of the most egregious violations of civil liberties in modern American history. The actor George Takei, who with his parents was interned in one of the camps, has written that two big lies, including the fiction that a law exists demanding the separations, have fueled the authoritarian border policy. When the president of the United States, against most credible advice and in the face of much history about how global trade works, imposes tariffs on imports from the nation’s closest allies and threatens retaliation against American companies it’s difficult not to conclude that he is playing on old fears about globalization. The president has now actually uttered the words “enemy of the people,” a term Stalin often used, to label the press that routinely still calls out his lies and incompetence. Americans, long content to embrace our myth of “exceptionalism,” now are grouped with a growing list of nations around the world where democracy is in retreat. Yes, it is happening here. We are exceptional, but not in the way Ronald Reagan or Franklin Roosevelt envisioned. One can look back over the tumultuous last 18 months of American history in one of two ways. One type of analysis would say: True enough, Donald J. Trump has upset a lot of traditions and norms in American politics. Other presidents have been liars, exaggerators, provocateurs who upset the status quo. We may not like all his language or emphasis, but the United States has been around a long time and navigated many challenging times. Trump has attacked judges and journalists, trashed Democrats and tarnished his GOP critics, but the system still works. We’ll be fine. Another version of the same facts might well reach an altogether bleaker conclusion. The systematic dehumanizing of refugees and immigrants will last well beyond the current occupant of the White House. The disparagement of the independent press undermines, perhaps permanently, a vital check on misconduct and abuse of power. The criticism of judges, the claim that a special counsel investigation is “a witch hunt” and the suggestion that due process is an outdated concept are broadly damaging to the concept of the rule of law. The widespread abrogation by Congress of oversight of the executive branch – few oversight hearings, little if any complaint about manifest ethical transgressions and embracing policies and approaches Republicans would once have rejected totally – is an historic erosion of the time-tested systems of checks and balances. Nationalism, anti-globalism, trade wars, a growing cult of personality around Trump all show a clear and dramatic break with American values. This cannot end well. Historian Benjamin Carter Hett notes several times in his profoundly important book about the fall of the Weimar Republic that most Germans in the 1920s and early 1930s really didn’t want violence in the streets, didn’t want to see the “liberal” values of an enlightened society crushed, but for most it was difficult to tell in real time how bad things were becoming. And then it was too late.